A Mirror of the Soul / Monthly Pioneer Magazine of the Sixth Race, Devoted to Theosophy / The Pioneer Magazine of the Sixth Race / A Monthly Publication Devoted to the Sacred Science of the Self-Evolution of Man. Chicago, IL. Publisher: Celestia Root Lang / Independent Theosophical Society of America / Divine Life Press / Harry R. Lang. Editor: Celestia Root Lang, editor and publisher; Harry R. Lang. 1/1 November 1906-1935(?) $1.00-$1.50 a year, 36-120 pp. (varies). The journal was not published April 1907 to April 1908, because, as it explained on its revival, it was in the process of establishing its own press. Celestia Root Lang (1842-1924), the founder and editor of this journal, was an eccentric Theosophist. (The Canadian Theosophist in 1922 unkindly called her "the Charles Chaplin of the movement.") The journal, nonetheless, is important for the history of the Theosophical Society because of its relentless and well-documented attacks on the foibles of Annie Besant, C.W. Leadbeater, the Coming World Teacher, the Old Catholic Church, etc. 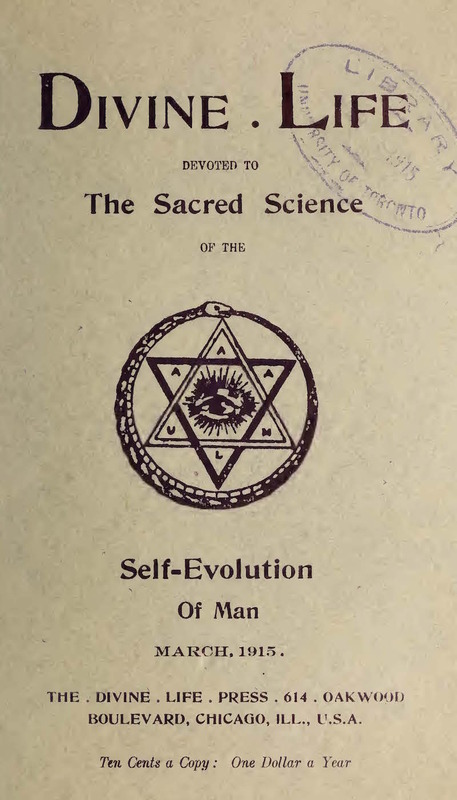 Lang appeared to public notice with the publication of "Son of Man;" or, The Sequel to Evolution (Boston: Arena, 1892), which contained the first intimation of her fundamental perception that the human race had evolved from mere animal consciousness to self-consciousness and was in the process of developing "Cosmic Consciousness." As she proclaimed in the first issue of the journal, "With the development of this consciousness, which is the effect or the result of the development of the inner senses, the faculties inherent in the soul within our sense perceptions, with it comes an illumination of the higher intellect, or Buddhi, the highest faculty of intellection; and we must remember that Buddhi is never separated from Atma, which is Spirit the Higher Self, the God with in us. Thus, by the development of the inner senses we come into degrees of super-consciousness; a consciousness of immortality, eternal life, the divine life; as real as sight in our eyes; to such the doubt of God, and eternal life is as impossible as to doubt our own existence." All mystics, messiahs, prophets, according to Lang, shared this realization and their teachings on how mankind could realize this new state of consciousness were embodied in the original principles of the Theosophical Society. "I believe that the Messiahs, Prophets, Masters, Mystics, Seers and Sages are those who have developed, in past lives, the faculties of the soul; hence at birth they are in advance of their race." Her articles appeared for a time in Religio-Philosophical Journal but apparently were not well enough received because she prefaced her journal with the complaint: "Having sent articles for publication and finding no place for them, I have provided in my little magazine, The Divine Life, a vehicle in which these Great Truths may ride in their own chariot." Most of the content of the journal was written by Lang, who introduced the journal by serializing her (blank verse) epic "Behold, the Christ! The Epic of the New Theism, the Gospel of Love deals with the super-conscious plane Personages: The Blessed One personates the Higher Self, and Alindah, the awakened soul Sitting at the feet of the Blessed One taking knowledge." On the revival of the journal in May 1908 after a year's hiatus, Lang attempted to incorporate the work of the Order of Uranian Mystics (the A.U.M.) of Sister Onfa with her own, establishing Lodge II, A.U.M. of U.S.A., in Chicago. Santa Onfa de Santos (1857-1914) was a Theosophically inclined mystic who sought to "carry carrying forward the work started by that great Loyal Soul whom we know as H.P.B. ; it is our portion to restore to Christianity its lost Mysteries, and to show that it is identical with that of every great world religion ; we know, and will prove that the Blessed Master of Nazareth was indeed a Prince Adept, a true Son of God, that His Crucifixion was a triumph and not a sacrifice as the Church believes. The Lodge will restore, to those able and willing to accept it, the most pure and ancient Religion, the worship which prevailed during the reign of the Sons of God, on this planet." Lang seems to have been much taken by Sister Onfa and her Order of the Golden Rule, gracing the journal's cover with its emblem: a ouroboros enclosing a six pointed star with the letters A.U.M.A.L.A. This consolidation seems to have ended with Sister Onfa's death in New Mexico in 1914, and in December of that year Lang started her own Independent Theosophical Society of America with herself as president. In her later years, Lang began to work out the political ramifications of her ideas, publishing The Reverse Side of the Seal of the United States and its Symbolism (Chicago, 1916): "The reverse side must have been designed by a mystic, one versed in symbolism. . . . The time will come ... when the white stone (pyramid capstone) will become the headstone of the corner of our government ... in proclaiming a new religion in which all spiritual currents flowing from every religion shall meet in the perfection of the white stone ... having neither dogma nor doctrine," etc. This perhaps lends some credence to the statement of an imminent scholar that William Dudley Pelley succeeded Lang as president of the Independent Theosophical Society. NYPL; LOC; D.T. Suzuki archives, Japan (scattered).